Signature pancakes, fluffy 4-egg omelettes, fresh roast coffee, eggs your way, crispy bacon, locally made sausage, home fried potatoes, fruit waffles, stuffed crepes, skillets, burgers, salads, sandwiches…we've got it all! Since 1964, Tahoe has started its day with breakfast at Heidi’s Pancake House. The distinctive yellow Swiss chalet building in South Lake Tahoe has been the home of quality ingredients and plentiful portions for as long as most of us can remember. 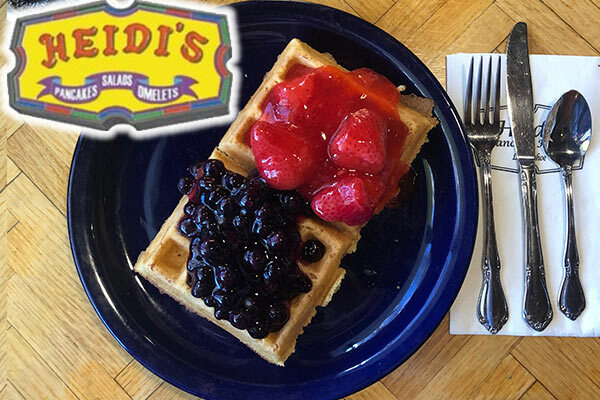 Whether you are are spending your day on the lake, exploring the mountains, or hitting the slopes, there is no better way to start your day than breakfast at Heidi’s Pancake House in Lake Tahoe.